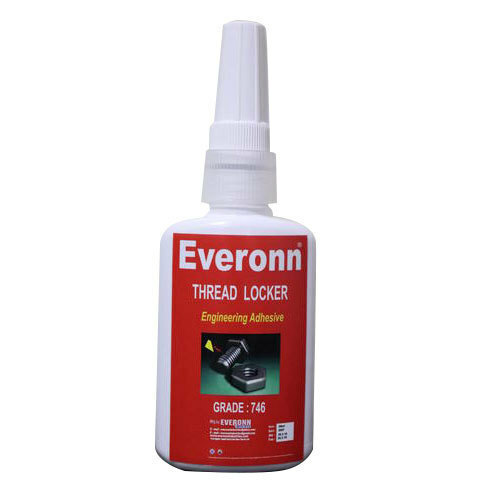 Matching up with the requirements of our clients, we are involved in offering Everonn Threadlocker Adhesive. At Everonn Industries sustainability has always been a part of our core values. From our inauguration, our entrenched values and ethics have been in coinciding with the same future-focused obligation that is so vital to sustainability. Founded in the year 2012, our venture is competing with the other esteemed competitors by the support of highly skilled panel of experts. Our organization is a Partnership based entity, headquartered at Anna Nagar, Chennai, Tamil Nadu, constantly handling its occupation as the efficient manufacturer of this industry. As a partnership based venture, we purvey customized solutions, including world-class products, which encompass Epoxy Adhesive, Release Agent, Engineering Adhesive, Instant Adhesive, Synthetic Adhesive, Silicone Sealant, Anti Spatter and many more. We create principles for our esteemed clientele through innovative technology, expertise in their industrial processes and by responding with a sense of necessity. We take pride in doing business with the highest of ethics and making responsible choices that reflect a long-term vision. Everonn Industries is manufacturer of Industrail Adhesives & Sealants like Anaerobic Adhesives & Sealants, Epoxy Adhesives,Rubber Based Liquid Adhesives & Gaskets ,Cyanoacrylate Adhesives ,Silicones Adheives & Sealants , Water based Paper Board Packing & Wood Adhesives , Water based Labelling Adhesives, N.D.T Inpection Chemcials (PT Type ) , Mould Release Agent (Solvent & Water Base) Welding Anti Spatter oil & Spray ,Maintenance Repair Overhaul (MRO) Industrial Aerosols .